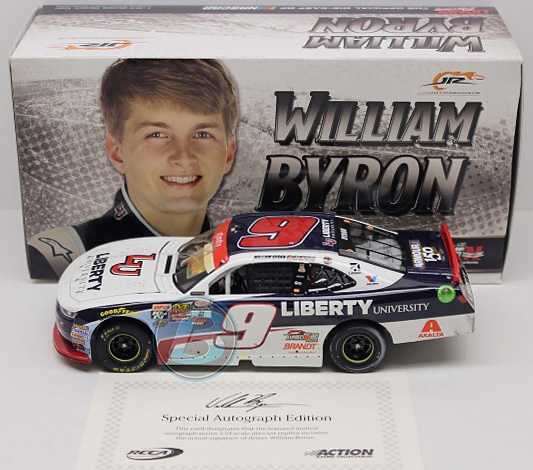 Autographed - This diecast car was autographed by William Byron, on the windshield in Silver. 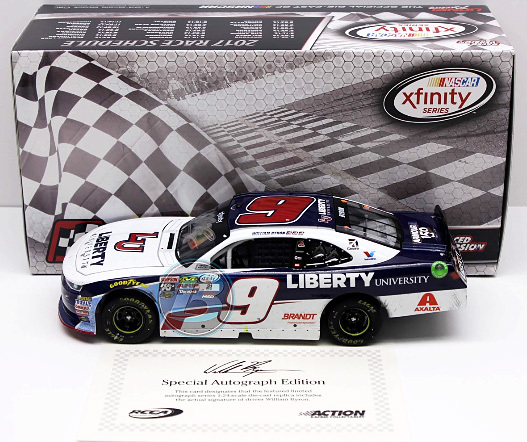 Includes an Action Racing Collectables certificate of authenticity and JR Motorsports hologram. 2017 William Byron #9 Liberty University / Homestead Champ / Raced Version / Chevrolet Camaro NASCAR diecast, by Action. William Byron raced this JR Motorsports #9 Liberty University Chevrolet Camaro in the NASCAR xfinity Series, Ford EcoBoost 300 at Homestead-Miami Speedway on November 18, 2017. 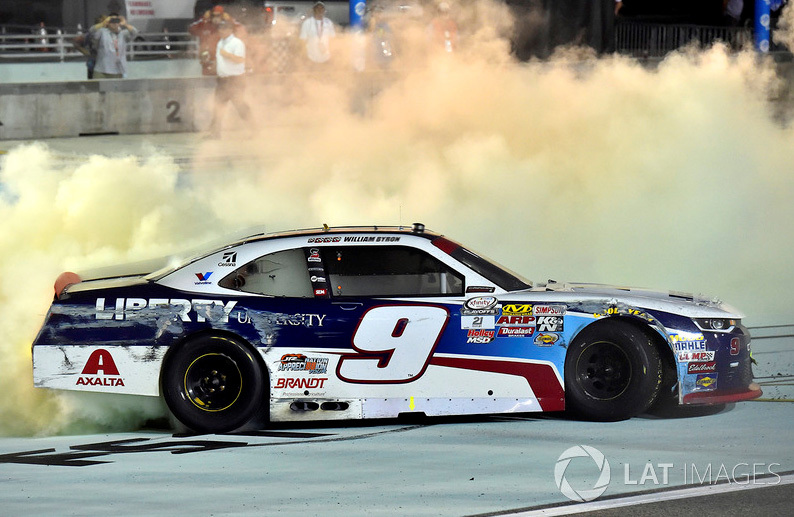 William Byron captured the 2017 NASCAR xfinity Series Championship at Homestead-Miami. 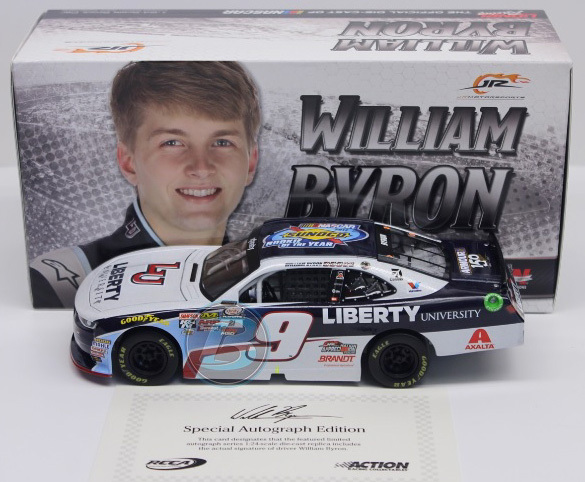 Autographed - This diecast car was autographed by William Byron, on the windshield in Silver. Includes an Action Racing Collectables certificate of authenticity. 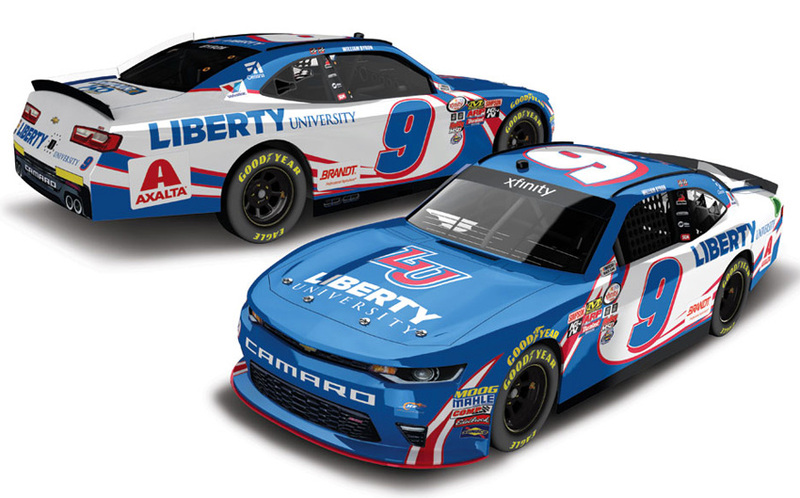 2017 William Byron #9 Liberty University / NASCAR Rookie of the Year / Chevrolet Camaro NASCAR diecast, produced with a Galaxy special finish by Action. This diecast car features the 2017 NASCAR Sunoco Rookie of the Year logo on the roof. William Byron, the 2017 NASCAR xfinity Rookie of the Year! 2017 William Byron #9 Axalta / Ameristar / Chevrolet Camaro NASCAR diecast, by Action. 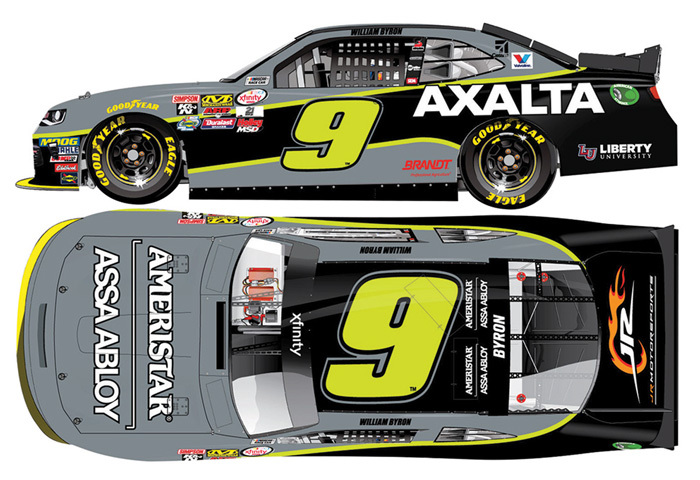 The JR Motorsports #9 Axalta Ameristar Chevrolet Camaro was raced by William Byron in several events during the 2017 NASCAR xfinity Series season. 2017 William Byron #9 Liberty University / Darlington / Chevrolet Camaro NASCAR diecast, by Action. 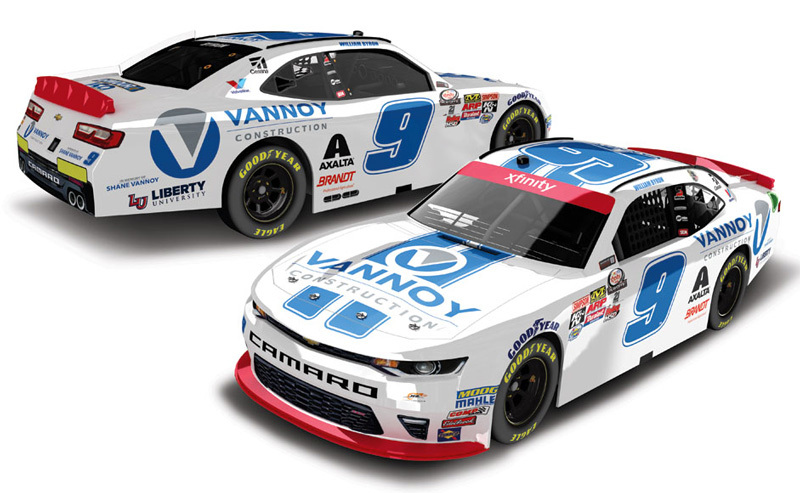 The JR Motorsports #9 Liberty University Darlington Chevrolet Camaro was raced by William Byron in the NASCAR xfinity Series, VFW Sport Clips Haircuts 200 at Darlington Raceway on September 2, 2017. This car will pay tribute to the late Joseph Riddick "Ricky" Hendrick IV - son of team owner Rick Hendrick. 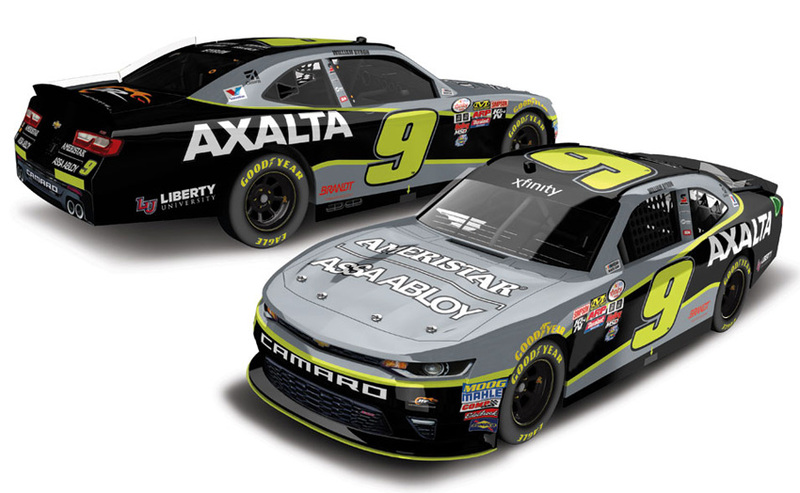 2017 William Byron #9 Axalta / Iowa Win / Raced Version / Chevrolet Camaro NASCAR diecast, by Action. William Byron raced this JR Motorsports #9 Axalta Windsor Chevrolet Camaro to victory in the NASCAR xfinity Series, American Ethanol E15 250 at Iowa Speedway on June 24, 2017. 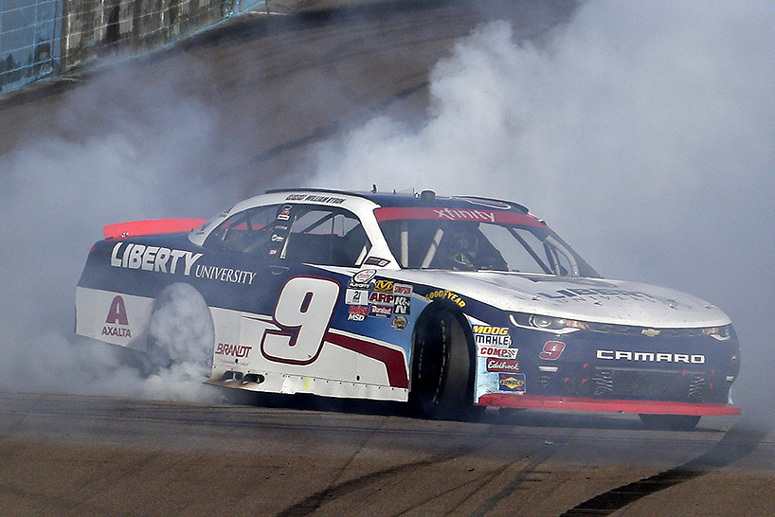 This was William Byron's 1st career NASCAR xfinity Series Win. This diecast car comes with an official, actual size race winner decal. 2017 William Byron #9 Axalta / Iowa Win / Raced Version / Chevrolet Camaro NASCAR diecast, by Action. 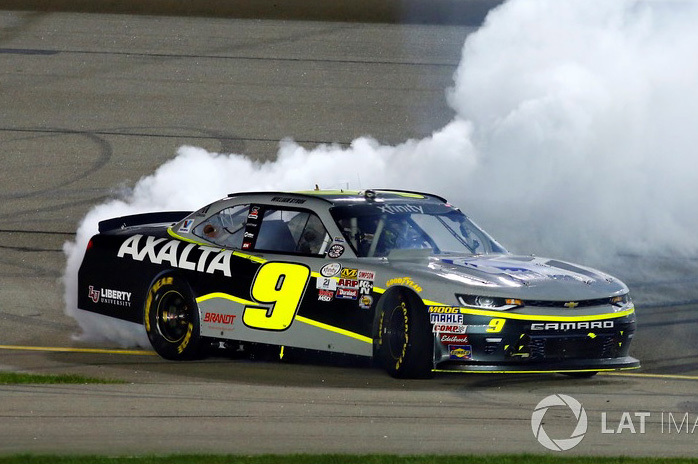 William Byron raced this JR Motorsports #9 Axalta Windsor Chevrolet Camaro to victory in the NASCAR xfinity Series, American Ethanol E15 250 at Iowa Speedway on June 24, 2017. This was William Byron's 1st career NASCAR xfinity Series Win. 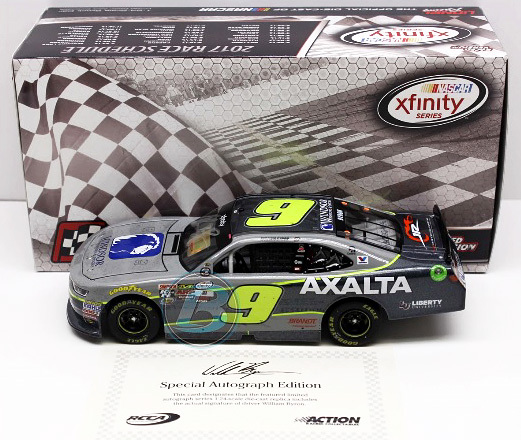 2017 William Byron #9 Axalta / Daytona Win / Raced Version / Chevrolet Camaro NASCAR diecast, by Action. 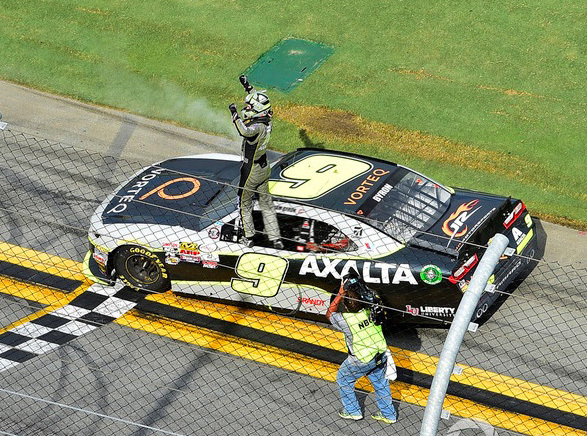 William Byron raced this JR Motorsports #9 Axalta Vorteq Chevrolet Camaro to victory in the NASCAR xfinity Series, Subway Firecracker 250 at Daytona International Speedway on June 30, 2017. This diecast car comes with an official, actual size race winner decal. 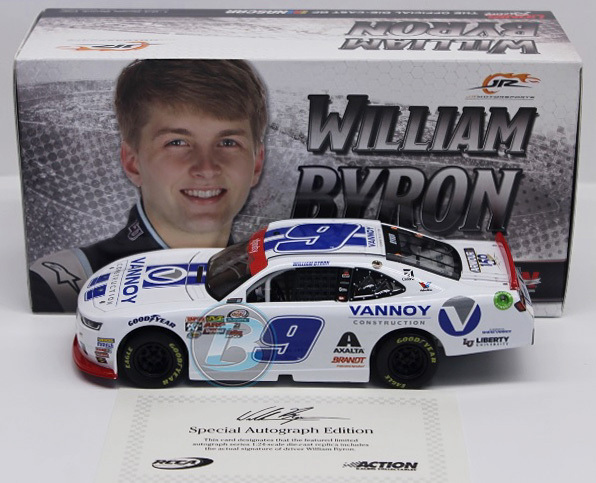 Autographed - This diecast car was autographed by William Byron, on the windshield in Blue. 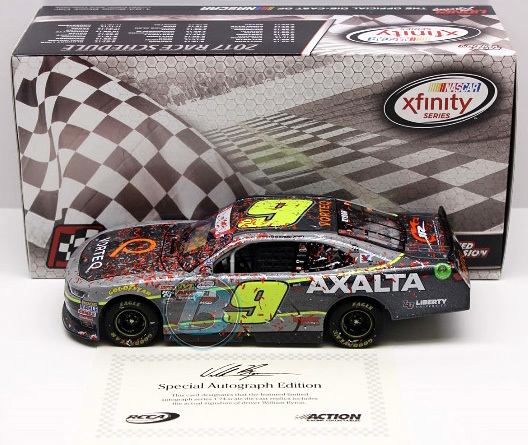 Includes an Action Racing Collectables certificate of authenticity and JR Motorsports hologram. 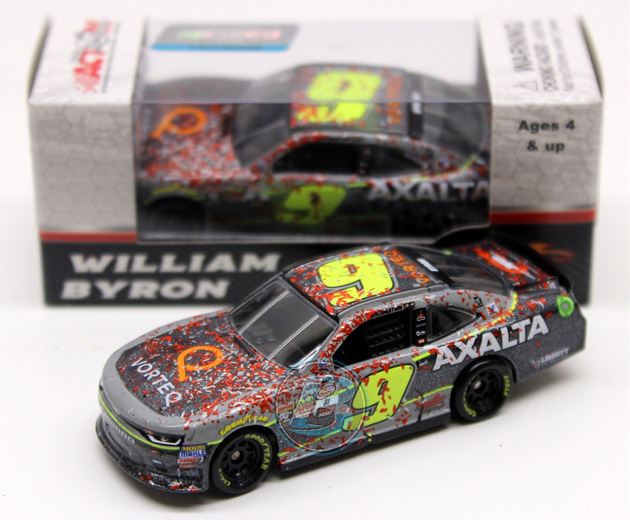 2017 William Byron #9 Axalta / Daytona Win / Raced Version / Chevrolet Camaro NASCAR diecast, by Action. William Byron raced this JR Motorsports #9 Axalta Vorteq Chevrolet Camaro to victory in the NASCAR xfinity Series, Subway Firecracker 250 at Daytona International Speedway on June 30, 2017. 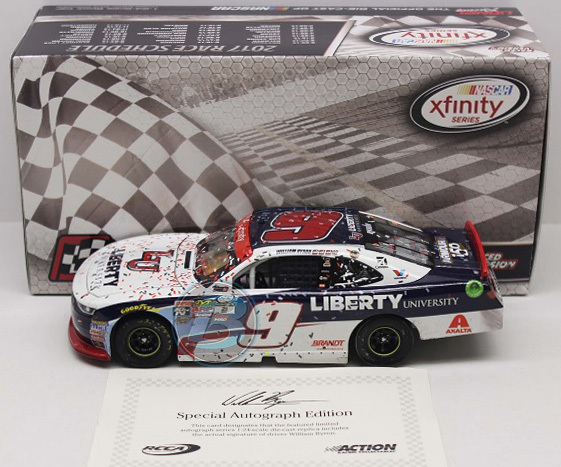 2017 William Byron #9 Liberty University / Indy Win / Raced Version / Chevrolet Camaro NASCAR diecast, by Action. 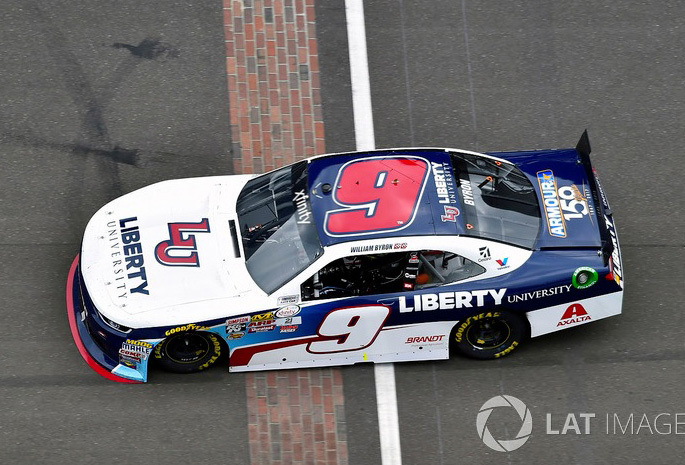 William Byron raced this JR Motorsports #9 Liberty University Chevrolet Camaro to victory in the NASCAR xfinity Series, Lilly Diabetes 250 at Indianapolis Motor Speedway on June 22, 2017. This diecast car comes with an official, actual size race winner decal.